The money is in! The Army received its FY18 Defense Acquisition Workforce Development Fund (DAWDF) allocation on Oct. 23, 2017. Work with your DAWDF Program Analyst, adjust those spend plans and begin immediate execution of any pre-approved training initiatives! Overview of Acquisition Ethics (CLM 003) – DAU Continuous Learning Module. Ethics at Work (HBS 415) – DAU Continuous Learning Module. Watch the 16-minute DAU online Ethics Video (ETH 004). Once the requirement is complete, be sure to capture it in your CAPPMIS-IDP using one of the following titles to receive credit: CLM 003; HBS 415; ETH 004. Craig Spisak has been named the Army Director of Acquisition Career Management (DACM). This small title change will better align the Army DACM Office to the other service DACMs and should be a fairly seamless change for the AAW. 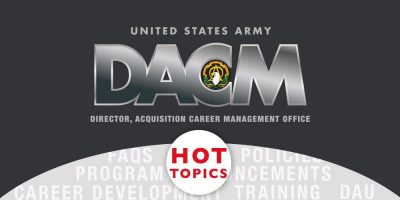 The Army DACM is responsible for ensuring acquisition career and leader development, talent management, Defense Acquisition Workforce Improvement Act (DAWIA) certification, and DAWDF management for the 38,000-strong AAW. CLC 025, Small Business Program for Contracting Officers, is retired and replaced by CLM 059, Fundamentals of Small Business for the Acquisition Workforce. FAC 026, Cost Analysis, is now retired. Have you ever wondered how your acquisition career and leader development programs are prioritized and integrated? Would you like an opportunity to influence the process? Raise Your Voice! Find out how in the October Army DACM Newsletter. Coming soon! A new website for the Army DACM Office will roll out in late November—a virtual one-stop-shop for the AAW with improved navigation and tons of user-friendly resources. The last day to apply to the Competitive Development Group/Army Acquisition Fellowship program is fast approaching. Please submit the application through AAPDS in CAPPMIS no later than Dec. 14, 2017. Heads up, military personnel! Applications for the Advanced Civil Schooling Program must be submitted no later than Jan. 15, 2018. Please refer to Milsuite for additional details. NCOs, your time is NOW! The deadline to submit applications for the military occupational specialty 51C reclassification board is Dec. 29, 2017. Additional information can be found on the 51C webpage. Keep an eye out! The Acquisition Leadership Challenge Program (ALCP), one of the most popular classes ever offered for the AAW, fills up fast. The 2QFY18 announcement will open in mid-November. Naval Postgraduate School is revamping its current Program Management MBA curriculum into a more technical and systems-engineering-based degree program. This new program no longer requires calculus, and is designed to help graduates better interact with program technical experts in fields such as engineering, test and evaluation, and contracting. The update is expected to roll out in early July 2018 for both military and civilian personnel. This curriculum change effects only new applicants. More information coming soon to our Army DACM Office website.